TvTropes.com is a massive time sink that always draws me and ends up devouring hours of my life. Over time it has become a reference point and resources for me as a writer. First, it was reading about the different kinds of villain existed out there and then the kinds of plot goals. The more and more I read, the more I began to used tropes to pull apart my own work. I saw threats of design and saw how each trope was used in different media. When I began my work on Land in the Stars I spent hours upon hours reading through the site. As we’ve discussed before, the foundation and the themes of said foundation permeate all further decisions. By seeing how people have used a trope in the past can alleviate a worry of how it might play out. It can also let a creative know of something they wish to avoid. The Five Races is a long-standing trope which divides fictional species into a series of traits. Historically, one race is the ancient failing civilization of old, aka Elves. Then you have a dwarflike species who is strong, brutish and often loves to smith and drink a lot (not to mention unnecessary Scottish accents)! Humans in these cases are shown as the mundane jack-of-all-trades species. These are only three of the five, but it gives a sense that the trope while useful boils down an entire group of peoples to a singular stereotypical sound-bite. In this case tropes should be used to lay the groundwork for creativity, rather than necessarily following the company line. The Oseram of Horizon: Dawn easily fits into the story of the stout with their interest in delving, smith and working hard. But in this case, their hardy culture while dwarflike is human and has its own intricacies and culture. In Dragon Age, both Humans and Elves fit the trope of the High Men with respect to the ancient Tevinter Magisters and the ancient Elves (the relationships go deeper, but no spoilers)! Nothing says you can’t have two high men races or three mundane species. This is where researching a trope and pulling it apart becomes part of the adventure of creation in of itself. For Land, in the Stars, our most populace race is a mixture of the “mundane and the high men”. The Faeru are effective to blame in part for the creation of the all four races, and most of the current problems in the modern universe. The stouts are a bunch of scientific undead cyborgs, and the faerie race are elementals. The dynamic of the Five Races is how you offer different tastes with each species (different culture/ biology / psychology) to the world you are creating. Once you pick a base trope, it’s time to start assembling them together to create the patchwork foundation for your creation. If someone mentioned a gritty setting with power suit armored warriors a menagerie of ideas could appear from Warhammer 40k’s Space Marines to the Knights of the Brotherhood of Steel. Disassembling the elves of fantasy let us take a look at the Elves of Dragon Age! Can’t Argue with Elves lends a sense of superiority along with their enslaved status and the fact that the very that the cosmos has it in for them renders them in a status culturally for a desperate purpose in life. These various tropes all string together to tell us the tragic tale of the elves which even when fully revealed shows how truly deluded the different factions have become about their history (no spoilers, play DA: Inquisition)! Tropes often lend themselves to other tropes and thinking in patterns is a good way to create them. this is furthered by the split between the Dalish elves who pepper their language with Poirot Speak to illustrate the lack of pure knowledge of the dying Elven language. Then the elves themselves show long term dislike of humans, especially the Dalish for the years of abuse heaved upon them. Previously I stated that Themes compound each other and through different changes, we effect different results in similar worlds. Most fantasy worlds feature some sort of archaic either highly advanced or powerful in some way. Most of these organizations are either a form of the unnamed “Kingdom” or act as dying decaying nations. In Dragon Age, a former regime of its old empire, Tevinter, caused the evil rise of the Darkspawn (the mass mook enemies). At the end of the day how you choose your trope is up to you. I personally spend days using a cadre of related personal fan favorite examples as a means to understand the expression of a trope. I might read up on how Dwarves have appeared throughout history in entertainment. Research into this has revealed some troubling archetypes with them being portrayed as isolationist greedy merchants and miners (often attributes given to anti-semitic propaganda against Jews). Through research, we can learn how to avoid these problems, and better yet, make the trope work for us in a way that is far more fun and interesting. The Kingdom itself can go from a universal magical land to an ideal or perhaps a nightmare. What would a Vestigial decaying empire render with a knightly band of orcs trying to deal with misguided human racism? What if elves were, in fact, a made up race in the fantasy universe, but somehow still had a connection to it? How could subvert the five races into tribes? 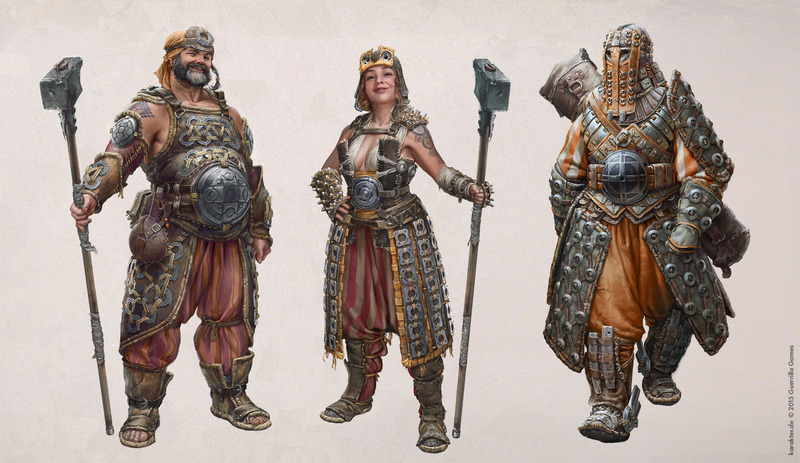 Something Guerilla Games did with the tribes of Horizon: Zero Dawn (Ancients are High Men etc). From your foundation, you weave the basics of your world and through the themes, you choose that world becomes filled with depth. Then for better understanding how everything can be expressed you can see others have done so via the understanding of tropes. The sky is the limit for creatives, all you have to do is take a breath and begin.